The article in this week’s That’s Maths column in the Irish Times ( TM039 ) is about Oliver Byrne’s amazing technicolor Elements of Euclid, recently re-published by Taschen. Oliver Byrne (1810–1890), a Victorian civil engineer, was a prolific writer on science. He published more than twenty books on mathematics and several more on mechanics. The one remembered today is his remarkable edition of Euclid, published in 1847, with the title “The First Six Books of the Elements of Euclid in which coloured diagrams and symbols are used instead of letters for the greater ease of learners”. Byrne’s innovative idea was to make the task of learning geometry easier by using diagrams in bright primary colours for illustration and for the demonstration of proofs. Equal angles, lines or areas were given the same colour. Byrne claimed that with this colour method the Elements could be mastered “in less than one third of the time usually employed”, as demonstrated by various experiments. His expressed aim, “to teach people how to think, and not what to think”, may have a familiar chime for advocates of the new Project Maths. In the nineteenth century, geometry had a central role in pedagogy and was regarded as an essential component of a balanced programme of education. Oliver Byrne was motivated by didactic concerns and aimed “to facilitate the acquirement” of the understanding and use of geometry, which he described as “the best gymnastic of the mind”. Byrne wrote that his colour method “may be reckoned the only improvement which plain geometry has received since the days of Euclid”. Byrne was not in the vanguard of mathematical thought. 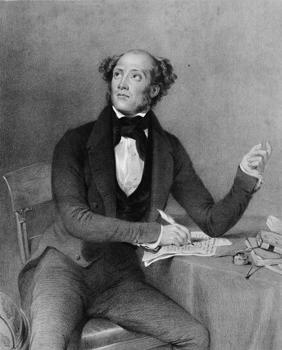 He regarded Euclidean geometry as “the basis of mathematical science all over the civilised globe”, a view outmoded even in 1847. According to Augustus de Morgan, a leading mathematician of the day, Byrne was “ a minor, rather eccentric” mathematician. The book was regarded as something of a curiosity, and was largely ignored by most of Byrne’s contemporaries. It did not sell well: the price was 25 shillings, four or five times the typical book price at the time, and 75% of the stocks were still on hand in 1853 when the publisher, William Pickering, went into bankruptcy. Left: Oliver Byrne’s diagram (1847) for the Theorem of Pythagoras. 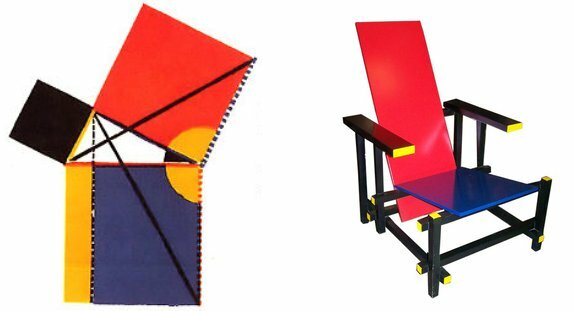 Right: Gerrit Rietveld’s Red and Blue Chair, 1918. Left: Diagram from Oliver Byrne’s Euclid (1847). Right: Piet Mondrian’s Composition II in Red, Blue, and Yellow, 1930. 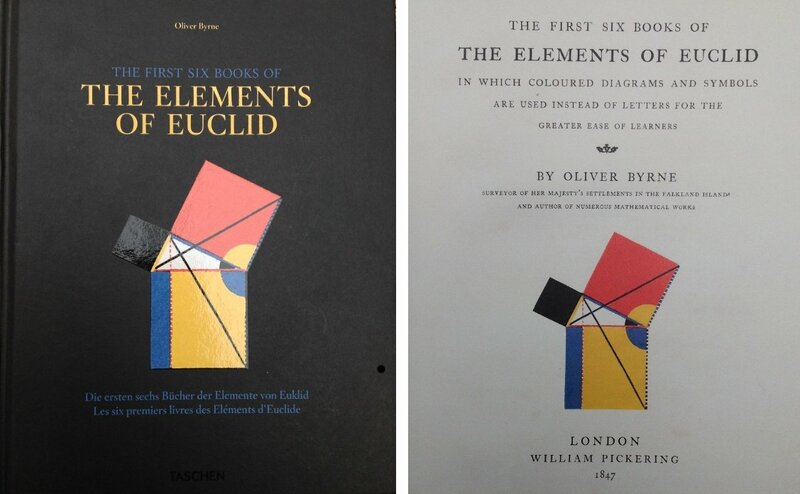 Byrne, Oliver, 1847: The First Six Books of the Elements of Euclid. New edition, Hardcover, 20.5 x 25.6 cm, 396 pages. Taschen, 2010.